Organisers of a large public art project occurring in the Creative Quarter in New Brighton Mall in late November are welcoming local participation in two unique public art performance works by visiting notable artists, with initial open workshops November 9th to 11th. “These are works for the community to enjoy getting active and creative in with no professional experience required,” says one of the organisers Mark Amery. Productive Bodies with performance artist Mark Harvey, recently returned from performing at the Venice Biennale, invites the community to join a fun but productive group creating actions testing notions of work that lead to increased business/ personal confidence and happiness in Christchurch, and living and working in New Brighton. The work follows a similar work performed in Wellington as part of the New Zealand International Festival of the Arts in 2012. Harvey is particularly keen on participation from people who engage with volunteer work; those who feel vulnerable in their work situations; people out of work; artists; and those interested in the renewal of New Brighton. 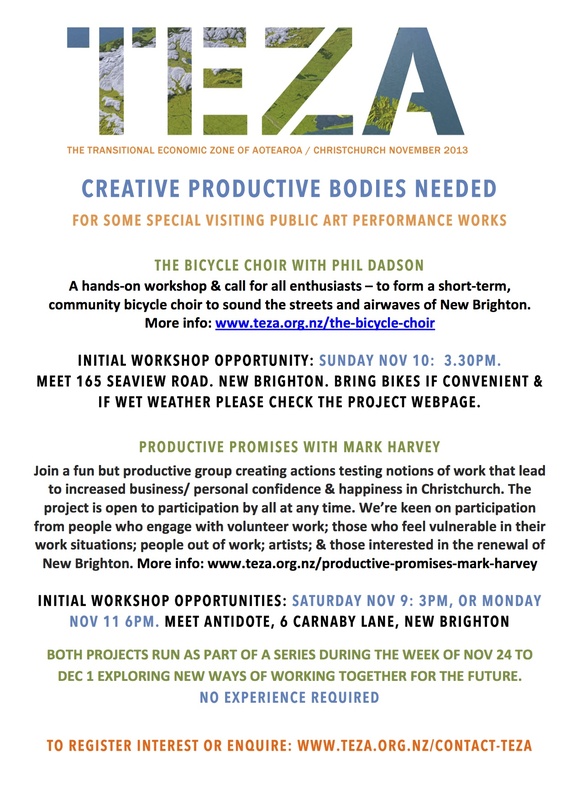 The public is invited to initial workshops Saturday November 9 at 3pm or Monday November 11 at 6pm at Antidote, 6 Carnaby Lane, New Brighton. The projects are being produced by Letting Space, a nationally celebrated public art programme that specialises in temporary art works that aim to enable social change. 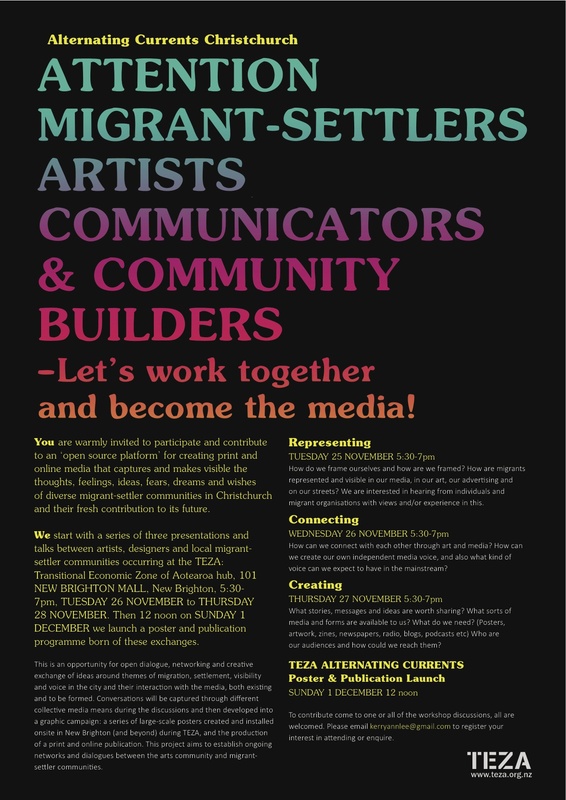 During the week of 25 November – 1 December TEZA Transmission will be a channel for documentation and recording in various media of TEZA activity and discussion. We aim to provide a platform that communicates the rigour and energy of new forms of exchange occuring in Christchurch and within the Transitional Economic Zone of Aotearoa. Right now you’ll find new bits of news up here, and please also join the Letting Space Facebook group, which will be a key interim channel for providing regular updates. Not on Facebook or rather not be? Subscribe to updates here. sounds fantastic can we stream me doing something I do in Stockholm bike and all? Thanks Alexandra sounds great can you send us a link to you/your group?